On Nov. 16, General Dynamics Bath Iron Works held a keel-laying ceremony for the Thomas Hudner (DDG 116), the company’s 36th Arleigh Burke-class guided-missile destroyer. The ship is named for Captain Thomas Hudner Jr., U.S. Navy (ret. ), a Korean War aviator and Medal of Honor recipient. 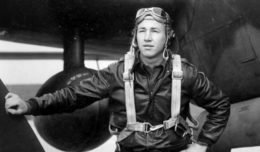 Hudner intentionally crash-landed his plane during the battle of the Chosin Reservoir on December 4, 1950, in an attempt to save his wingman, Ensign Jesse L. Brown, who had been shot down. Hudner attempted to pull Brown from the wreckage, but was unable to do so. He packed snow around the ship’s fuselage to keep flames at bay, while taking enemy fire. Brown succumbed to his wounds, and Hudner was evacuated from the site. Hudner, a resident of Concord, Mass., has visited the shipyard on numerous occasions. He was on-hand for the keel-laying ceremony, accompanied by numerous friends and family members. Hudner had previously signed his initials onto a steel plate that will be mounted on the ship bearing his name. At the keel-laying ceremony, ship’s sponsor Barbara Miller added her initials to the plate, authenticating it by striking welding arcs onto it, assisted by Matt Perkins, a 34-year Bath Iron Works welder. The keel unit is the 3,000-ton, heavily outfitted mid-section of the ship which contains its main machinery spaces, and is the “heart” of the ship. The unit is roughly a third of the entire ship, and was recently moved from the shipyard’s Ultra Hall construction facility onto the building ways. The Arleigh Burke-class destroyer is a multi-mission combatant that offers defense against a wide range of threats, including ballistic missiles. It operates in support of carrier battle groups, surface action groups, amphibious groups and replenishment groups, providing a complete array of anti-submarine, anti-air and anti-surface capabilities. Designed for survivability, the ships incorporate all-steel construction and have gas turbine propulsion. The combination of the ships’ AEGIS combat system, the Vertical Launching System, an advanced ASW system, two embarked SH-60 helicopters, advanced anti-aircraft missiles and Tomahawk anti-ship and land-attack missiles make the Arleigh Burke class one of the most powerful surface combatants ever put to sea.